Biltmore Village, located across from the entrance to Biltmore Estate in Asheville, is home to more than 40 shops and 10 cafes and restaurants. Most businesses are housed in historic cottages and buildings. Tree-lined streets, brick sidewalks and period architecture (including the Cathedral of All Souls) make the area a delight to stroll and explore. 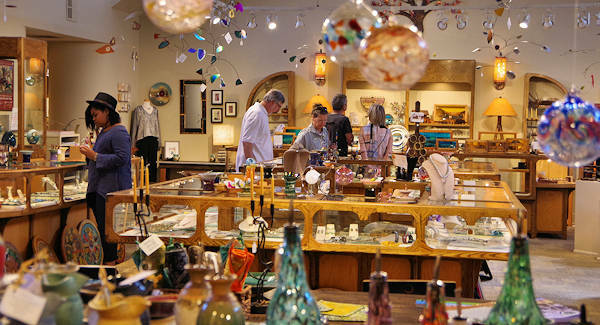 Village shops and galleries (pic above is New Morning Gallery) offer a diverse selection of merchandise, from one-of-a-kind decorative and functional craft items to original artwork, custom-designed jewelry, clothing, home accessories, antiques and more. There's free parking. Longtime favorite Blue (1 Swan Street) has creative, modern, non-conventional jewelry created on-premise by master goldsmith Susan West, and Monkee's of Biltmore (7 All Souls Crescent), a ladies designer fashion boutique filled with the latest trends. The Southern Highland Craft Guild, with headquarters at the Folk Art Center on the Blue Ridge Parkway, has a wonderful gallery featuring gorgeous creations from Appalachian artists in nine states. 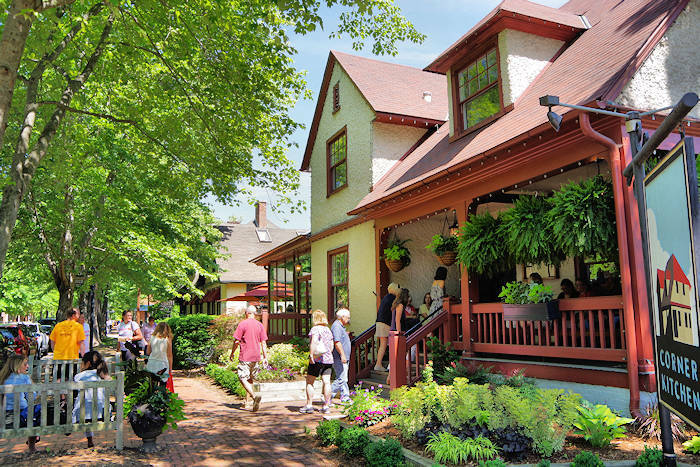 Biltmore Village includes many hidden side streets with amazing finds, like London District Studios (8 London Road), and Bon Vivant vintage and artisan market (9 Reed Street). It's part of the up-and-coming London Entertainment District with live music and several breweries. Head over to Zen Skincare and Waxing Studio (25 Reed Street) for results oriented anti-aging facials and skincare, as well as safe and effective professional waxing services. 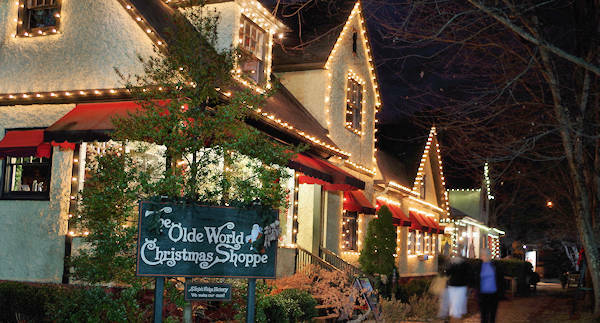 Christmas shopping at Biltmore Village is a special delight. Many shop before or after their Biltmore House tour. 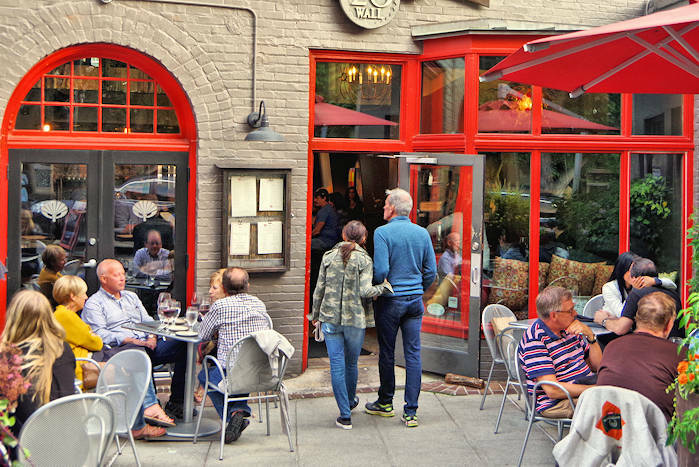 Cafes and restaurants at Biltmore Village present a wide variety of dining options, including the Corner Kitchen (3 Boston Way) farm-to-table American fare and Rezaz Mediterranean (28 Hendersonville Road) with a fantastic wine list. Craft breweries have opened in the Village area and more are planned. Try local beers at Catawba Brewing (63 Brook Street), French Broad Brewery (101 Fairview Road) and Hi-Wire Big Top (2 Huntsman Place). Sample 50+ beers, ciders and wines at Pour Taproom (2 Hendersonville Road). Nearby, The Wine and Oyster (2 Hendersonville Road) Italian wine bar serves fresh raw oysters, ceviche seafood dishes and imported meats and cheeses. Eda Rhyne Distillery (101 Fairview Road, Ste A) creates farm to flask craft spirits that capture the unique flavors of Asheville and the Blue Ridge Mountains. Complimentary tastings available Wed-Sat from 3-8 PM. Casablanca Cigar Bar (18 Lodge Street) has largest walk-in humidor in Western NC and an impressive bar with 130 whiskies, craft cocktails, wine, and local draft beer. Margaret & Maxwell Wine Salon (5 All Souls Crescent) is a boutique wine store with a cozy wine bar in the back of the building. Find more stores and restaurants on their website. This area is the best antique shopping in Asheville with ten stores and malls (with hundreds of dealers) within a mile and a half of the Village. 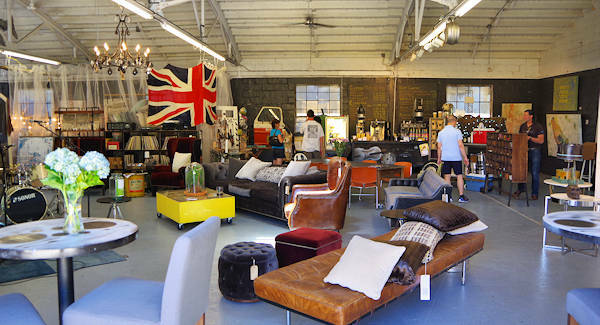 Read more about antique shopping. 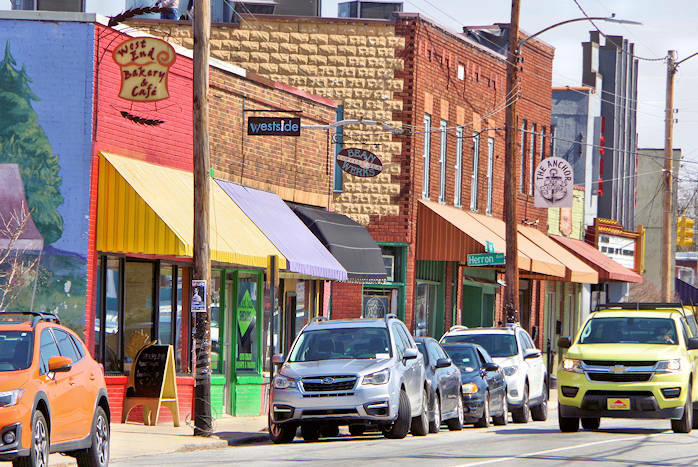 To reach Biltmore Village from downtown Asheville, take Biltmore Avenue south two miles. 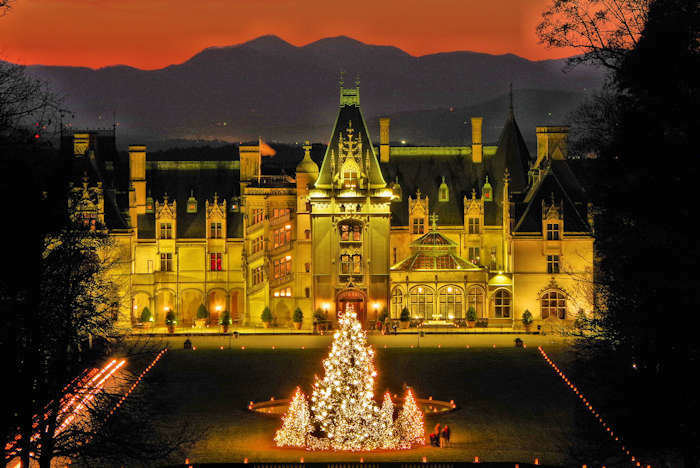 From I-40, take exit 50 and go 1/2 mile north (follow signs toward Biltmore Estate). There is free parking throughout the Village. Most shops are open Monday-Saturday, 10 AM to 5:30 or 6 PM and Sunday 1 to 5 PM. Many businesses extend hours for holidays. 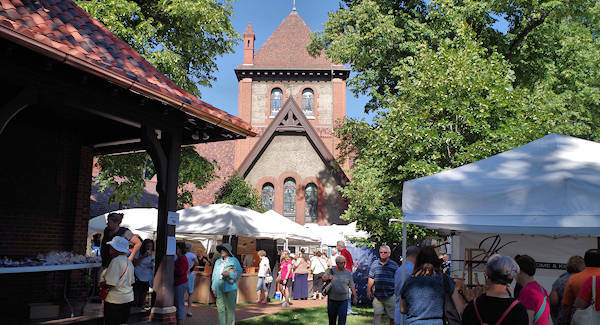 The first weekend of August brings the area's premier outdoor art and craft fair with 110+ carefully selected artists by John Cram and New Morning Gallery. The festive Fair draws thousands of eager shoppers from the Southeast to the beautiful tree-covered grounds of the Cathedral of All Souls in Biltmore Village. See our Village Art & Craft Fair Guide. 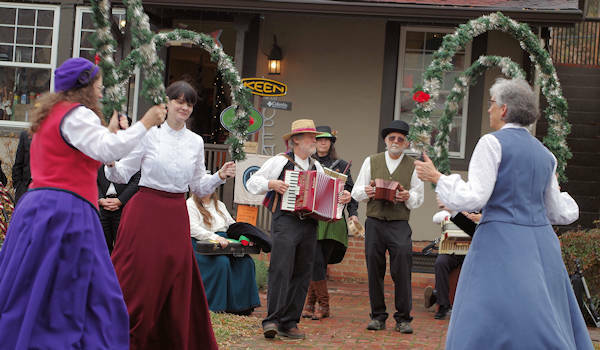 November 30-December 1, 2018: Historic Biltmore Village transforms itself into a quaint Victorian village. Enjoy concerts, refreshments and strolling vocalists and instrumentalists in costumes of the period. Pop up market on Boston Way 11-7 Friday. Tree lighting 6:30 PM Friday. Light display on Boston Way. See more events on the Biltmore Village website. 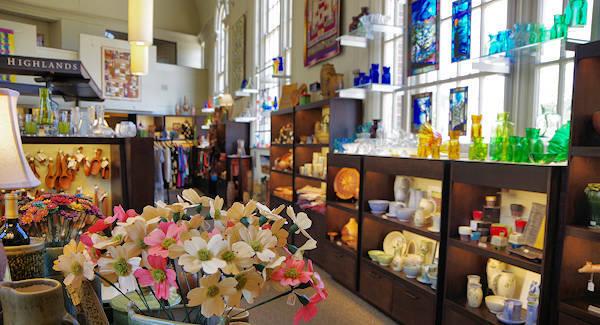 For more shopping and art, nearby are Downtown Asheville and the River Arts District. This classically-planned community was constructed in the late 1890s at the entrance to the Biltmore Estate. Originally designed as a picturesque residential prelude to the Estate, the Village recreates the quaint atmosphere of an English community. The streets are laid out in a fan shape. Most of the streets are short, terminating at the outer edge of the "fan," giving the Village a geographically self-contained design. The diagonal streets were designed to emphasize depth and create sightlines between focal points of the Village - the depot, the church and the Estate entrance. Biltmore Village was declared a historic area and a local historic district in 1989.